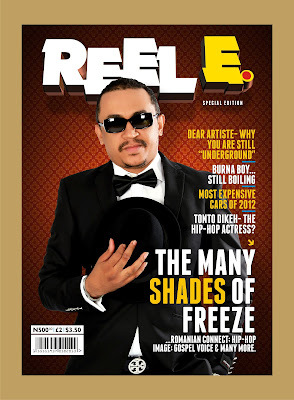 For the April, 2013 special edition of REEL E Magazine, the life and the sojourn of Ifedayo Olarinde a.k.a Daddy Freeze, as an award winning On-Air Personality (OAP) with Cool FM was critically x-rayed. The Editor-in-chief, Mr. Alayande Stephen T. said ”we took an incursion into the world of one of the most popular OAP in Lagos and by extension, Nigeria; he has over the years gradually cut a toga of a DON in the industry for himself. This is indeed revealing, captivating and salivating; you can’t but be interested to take a bite at the total package” he averred. FREEZE was costumed by SOGGYS’ Couture and photo by internationally acclaimed Dayo Ande (Chert Photos). Underground artistes are also catered for by REEL E magazine via the regular training and educative articles by 4LaH of Dear Artiste. Other columns like Fashion Army, Break-Out Stars, Color & Style, The Pacesetter, Box Office Review, Close-Up on Celeb etc are must read for all and sundry. It's a magazine you should never miss buying. REEL E Magazine is an all inclusive entertainment platform that intends to deliver incisive reporting with facts, depth and no barriers. The magazine provides the very best of happenings about celebrities across the globe with well positioned reporters in UK, Ghana and Asia. Indeed, it is a radical departure from the norm because it is HOT, SIZZLING, XCLUSIVE and OUT-OF-DA-BOX. It is published by Total Recall Media Limited, the Producers of REEL E on TV & Radio, E-ACCESS and Two Sides of a Coin soap series.